The best list of Quotes of the Year is not a list of political quotes, sports quotes or business quotes. But more about that in a moment. For the most notable quotes of the year, many sources cite Yale Law School librarian Fred Shapiro's annual list, published here at the Huffington Post for example. This year the tie for first place went to Christine O'Donnell ("I'm not a witch.") and Tony Hayward, former CEO of BP ("I'd like my life back."). I personally favor Hayward's as a more poignant reflection of our times. Neither of them is worthy of a place on your wall, however, and so you will not see these at QuotePalettes.com any time soon. You're welcome. 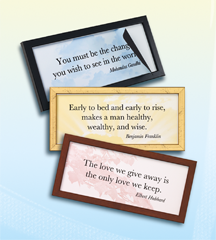 The website AllGreatQuotes.com publishes Quotes of the Week and the 2010 collection is posted here. This is a pretty entertaining and comprehensive list. ESPN has a list of the top 100 sports quotes. See the top 20 here. I'm not a huge sports fan, so these lists tend to sound the same to me year after year. At this tech blog, there's a unique list of IT related quotes of the year. I suppose the quality of a quote list like beauty is in the eye of the beholder. The best collection of 2010 top quotes for me is this list compiled by blogger Carolyn Robertson at the Momformation blog (babycenter.com/celebrities). If you're a parent, you'll enjoy this glimpse at the mom and dad side of Matt Damon, P. Diddy, Halle Berry, Michael J. Fox and others. Quotes are simply words spoken or written by others that hold special meaning to you. The most meaningful quote of the year for you may be something said by your child, your spouse or partner, your boss or your friend. Share them with us here. "I would like to introduce you to Evan Noel [Doe]. He was born on Friday October 8, 2010 at 2:20pm. He had some breathing issues but getting better by the day. I look forward to bringing him back to NY next week. Love Robin"
What motivates us to do our best work? Is it pride, ambition, money, passion for quality, love of the process, commitment to our team? Here are a few great quotes on what makes good work worth doing... Each one approaches the question from a different angle. Can a few choice words cure the Monday morning blues? . . . In the New York Times building in Manhattan today I shared the elevator with a middle-aged woman eating an orange. It would have been an uneventful trip to the 26th floor except that, as she peeled, a chunk of orange rind about the size of an iPod Nano fell to the elevator floor. Now if that were you, what would you do? All she had in her hands was the orange. There’s no doubt she saw what happened, just as I couldn’t help notice. She kept peeling and eating, ignoring the floor, and me. So I figured, well perhaps she’s just being efficient. In case she drops any more, she’s just waiting until she arrives at her floor to bend over and pick it all up at once. Then the elevator doors opened on 25, and she started walking out, leaving the peel there on the carpet of this otherwise pristine elevator. So naturally, I said, “Um, I think you forgot your peel.” I swear I said it. But now I’m not sure. Because there was no reaction whatsoever. She looked straight ahead and kept walking, leaving me with her garbage. When the elevator got to 26, I bent down to pick up the peel, feeling half suckered and fully repulsed. I thought of the kids of the woman in the elevator. I thought of the terrific example she must set for them every day. Leaving her tray of trash on the table for the fast food restaurant worker to clean up. Sticking her gum on the park bench. Cutting her whole family into the ticket-holders’ line (just ahead of my kids and me). What hope is there for civility when women like this are raising offspring? We can’t be there all the time to tell our kids to pick up after themselves. We hope by setting the right examples that they learn and show the world each day that they are not rude, they are not pigs. I don’t remember any particular moment as a kid when my mother or father set an example of using good manners. It was just a natural part of living. I will, however, remember the woman in the New York Times building and her orange. John Stuart Mill said, “In the long-run, the best proof of a good character is good actions.” Today’s small encounter was proof again that every action counts. Good quote - says a lot about someone's character. I was curious where he got it and started searching. It’s possible Tiger kept that quote in mind since 1980, to help him through a few slumps along the way. And putting the quote in that context explains a lot. If Tiger thought character was about overcoming golf slumps, he was a disaster waiting to happen. But perhaps Tiger remembered a more recent use of the phrase by Carlton Fisk, when the famous catcher was inducted into the Baseball Hall of Fame. Tiger would sure see the wisdom in that – “we are not perfect.” Also Fisk was talking about failure, not just golf slumps (are they the same thing to these guys?). Sounds more relevant to Tiger's situation. But the words, "that defines you" caught my eye. Tiger used the words, “that matters". I think if he knew the Fisk quote, he probably would have said, “that defines you.” It’s much stronger. Fisk of course did not coin the saying either, since he said, “Sometimes they say…” Perhaps he was a golf magazine subscriber, or a student of “philosophy and life” like Mr. Miller. Anyway, I was unable to find out who “they” were. The quote “it’s what you overcome” doesn’t show up online until Brainyquote attributed it to Mr. Fisk in early 2001. But the website appears to have misquoted him as saying, “It’s not what you achieve, it’s what you overcome. That’s what defines your career.” Numerous other quote sites have republished it as such since then. If you trust the transcript of the Hall of Fame speech Fisk delivered in July 2000 the original has a lot more punch. I hope Brainyquote fixes the Fisk listing, gives separate attribution to Mr. Miller’s version, and leaves Tiger off the quote lists altogether. This lovely quote should not hereafter be associated with overcoming a public relations disaster resulting from inexcusably bad judgment. No, this saying serves a higher purpose: it inspires us to overcome those challenges life presents that are beyond our control. Now that is the kind of context this quote deserves. If any of you can solve the mystery of the origin of the saying, please let us know. In the meantime, we will give Mr. Fisk – and certainly not Mr. Woods – the credit at QuotePalettes.com. Starting a new business is exciting, but overwhelming just the same. There’s a lot to manage and learn, and many expectations to fulfill. Feelings of excitement in a new endeavor are often shared with anxiety – and sometimes that can really slow you down. So how does one motivate to move forward and embrace something new? There’s a ton of resources in the motivational, “self-help” category these days. Some of it is downright hokey and a lot of it is just a rehash of age old wisdom. There is nothing new under the sun, Ecclesiastes 1:9-14. But I think the value in all this is in the reminding. And in many cases you can find very practical suggestions to action. The trick, I think, is in finding the words that move you. My latest find in the motivational category is "The Happiness Project" by Gretchen Rubin. I haven’t finished yet, but in general, I can say that Ms. Rubin’s book suits my style. Rubin, a writer, wife and mom in NYC, albeit with a pretty sweet life, was going about her daily routine when she was struck by the question - Am I Happy? So began a year long effort to apply various happiness strategies to her life systematically on a monthly basis. So, why does this book speak to me? • First off, I agree that those with a positive outlook are not easily thwarted by obstacles. Though it may sound trite, working on happiness sounds right. It may help the rest of life flow a little easier. • Secondly, Rubin did a lot of homework here, from Plato to Thoreau, to the great religions, as well as scientific research and current trends in positive psychology. For me, if you’re going to argue something, please back it up. • Finally, "The Happiness Project" is a readable memoir peppered with relevant quotes (and I like quotes!) that remind one how to turn a situation. One example relates to Rubin’s frustration when her husband doesn’t pitch in with the housework (well, at least not up to her standards). Sounds silly, right? But these are the things that actually lead to arguments! Here Rubin quotes the twentieth century English writer G.K. Chesterton, “It is easy to be heavy: hard to be light.” Yes, thank you. I am reminded. Try to keep your focus on the great things about this special person in your life. And the not so great… well, nobody’s perfect. Great words to remember if you're fussing about your own shortcomings, too! What’s really working for me right now is a phrase from Rubin’s chapter on parenthood - “The days are long, but the years are short.” I mentioned this one in my book club the other day and there was a collective “Ahhh”. From the viewpoint of a parent, of course, it really rings true. Remember to be patient; those kids will be off before we know it. I also hear in those words a gentle reminder to move forward. Don’t dwell on the “what ifs” – time is passing. And yes, some days are really overwhelming with a lot of loose ends flying around. But that’s just life and we need to get it going while we can. So even though it is the middle of January and not an otherwise auspicious day, today I'm posting this blog, moving forward, crossing one thing off my list... How about you? Where do you find motivation to start something new? This week you will probably say "Happy New Year" to a hundred people or more. Wishing people happiness is something we do a lot, without thinking much about it. We write "Happy Holidays" and sing "Happy Birthday." "Happy New Year" implies a grander vision - a whole year of happiness. Wow, that would be something. But perhaps it's not very realistic. Maybe we really mean, "have a happy year, more or less." Much has been written about happiness lately, partly because the "science of happiness" has gotten more legitimate traction. One of the people talking a lot about that science is Tony Hsieh, CEO of Zappos.com. Hsieh grew Zappos from nothing to a billion dollar company in 10 years by making company culture his number one priority (making culture #1 led naturally to better customer service, which led to off-the-charts customer loyalty, which led to a billion dollar buy-out by Amazon). Hsieh has developed a framework for long term happiness he is promoting as a model for growing a winning company. Hsieh's framework will no doubt be the focus of his book called "Delivering Happiness" to be published in March. His ideas are exciting and I hope they influence a lot of business leaders. But Hsieh didn't start out trying to make his company a "happy" one, at least not in the scientific sense. He just felt strongly that culture matters, and the business formula applied by Jack Welch and others (set company values to achieve market dominance, recruit talent to execute, motivate employees with money, recognition and fear of termination) often leaves company culture to rot. So he put culture ahead of market dominance. He and his team developed a list of specific values for the company and agreed to live by them. They set hiring and promotion policies to ensure that every Zappos employee would be inspired to his or her core to achieve the mission and reinforce the values of the company. This sounds hokey, but it worked. Then one day Hsieh picked up a book called "The Happiness Hypothesis" by Jonathan Haidt and things really started to click. Hsieh realized that hiring only people whose personal values were directly aligned with the company's values (and reinforcing those values all the time) created an environment at Zappos in which people felt they could (a) grow, (b) control their destiny, (c) share their values and personality, and (d) achieve a higher purpose than making money. These turn out to be four key ingredients we need in our lives to experience long-term happiness. This is a model on which we aspire to build our business someday. Making our company a place where organizational values align with personal values. Tony Hsieh will give a lot of credit to Haidt, saying "The Happiness Hypothesis" was the most influential book Hsieh has read in the past 5 years. But Hsieh hasn't talked a lot about what prevents us from achieving - or, more importantly, from even seeking - the kind of long-term happiness the Zappos culture fosters. To learn more about that, read "The Happiness Hypothesis". "Words of wisdom, the meaning of life ... all of these may wash over us every day, but they can do little for us unless we savor them, engage with them, question them, improve them, and connect them to our lives."